In conjunction with World Health Day on Thursday, April 7 2016, La Casa @ Solaris Dutamas came up with two carefully selected dishes especially for this occasion. With an aim to raise awareness for the importance of a healthy and balanced diet, I had the opportunity to try out both sets, titled Glorious Green and Ravishing Red. Both fares combine the art of slow cooking with the use of tasteful ingredients whose beneficial effects on the body have been scientifically proven. Check it out below. 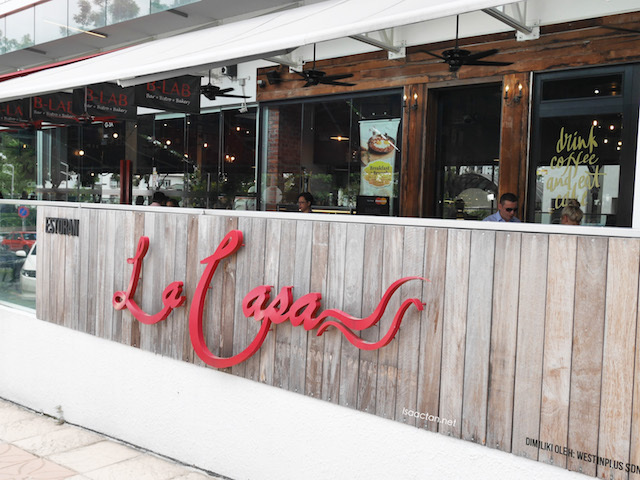 My first time dining at La Casa @ Verve Suites Shops, Mont Kiara, it's nice to see such a comfy place, serving healthy dishes specially catered for world health day. 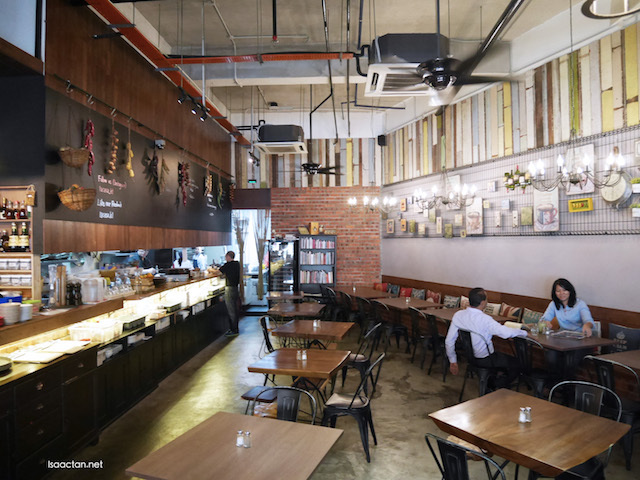 The restaurant specializes in home cooked wholesome food from thin crust pizzas to pastas served with tender chicken or delicious seafood and is famous for its variety of sweet handmade delicacies like cakes and colourful macarons. Each of the two sets to choose from consist of one main, one drink and a dessert, perfect meal for one during lunch or dinner. I tried the first set, aptly named Glorious Green Set Menu as main, Homemade Yogurt with Mixed Berries and a self-made Granola Bar as dessert and a glass of Green Apple-Celery-Cucumber Juice. 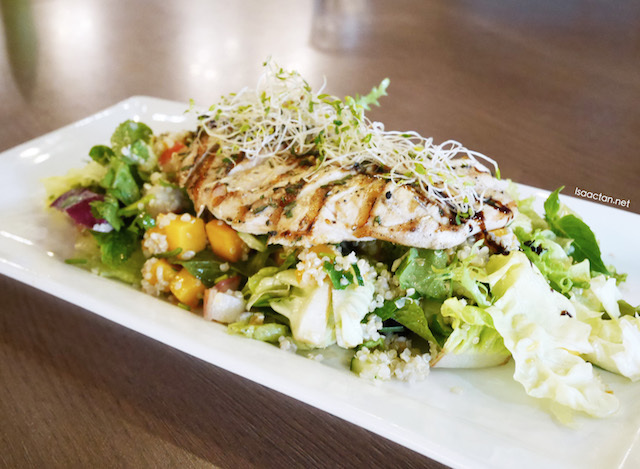 The healthy grilled chicken breast was infused with herbs, served with refreshing mint and cilantro quinoa salad, doused in tangy citrus dressing. Quinoa is also referred to as the mother of all grain and this label does not come from far because it is higher in fibre than nearly every other type of grain and full of cell-sustaining antioxidants. De-toxification Drink - Green Apple-Celery-Cucumber Juice. 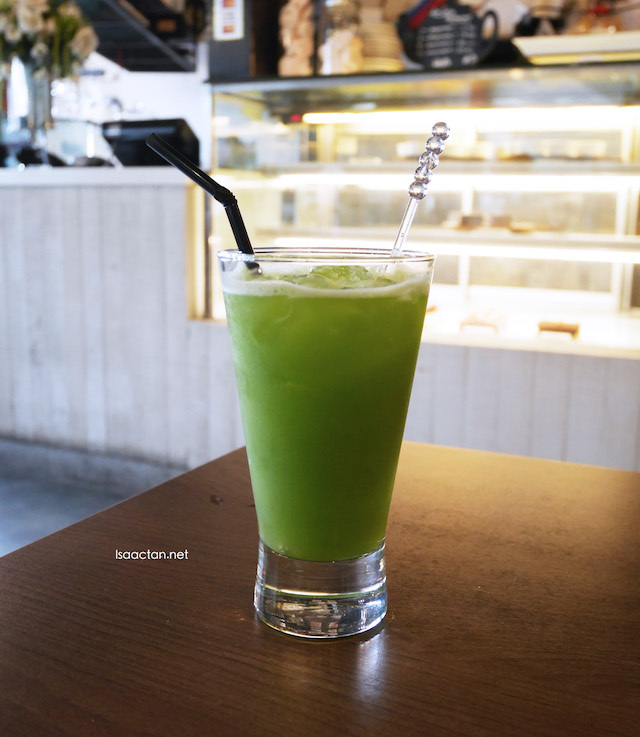 It is always good to detoxify the body, done beautifully via this refreshing glass of Green Apple-Celery-Cucumber Juice. It does look very green on first glance, but I'm fine with each of the ingredients used, and it made for a good drink after the chicken salad mains. 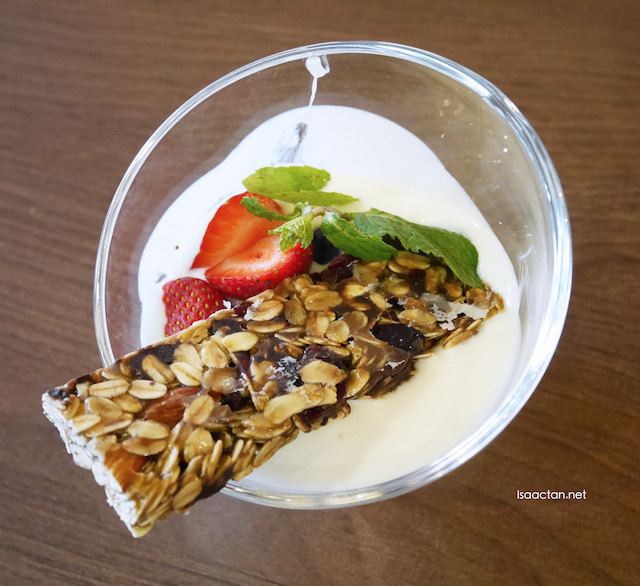 The set includes a plate of Granola Bar served with berries yogurt too. 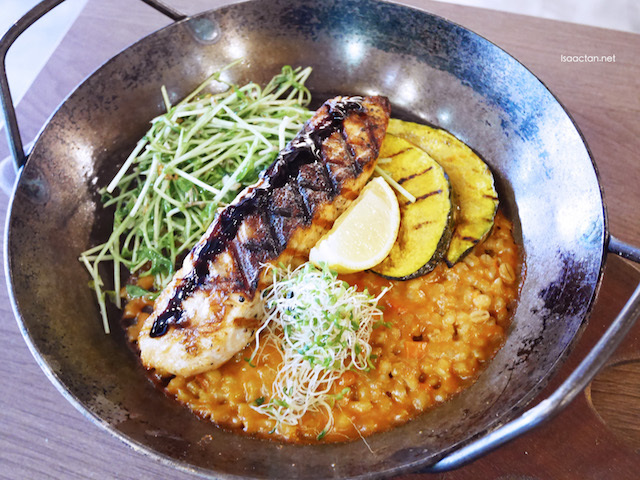 Ravishing Red’s main dish on the other hand is made up of Char-Grilled Salmon with Barley Risotto and Roasted Pumpkin. Barley works incredibly well as a flavourful substitute for rice and brings a new twist to the renowned risotto. It is widely known for lowering one’s cholesterol level and latest studies show that barley can reduce the sugar level and therefore minimise the risk of developing diabetes. 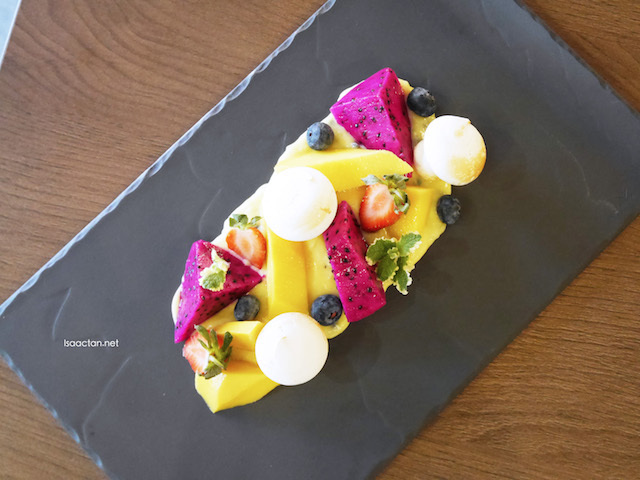 The dessert consists of Baked Meringue with Mixed Fruits on a Passion Fruit Sauce and as a drink I was served with a sweet Orange-Carrot-Honey juice, a natural and delicious beauty booster that will make your skin glow. 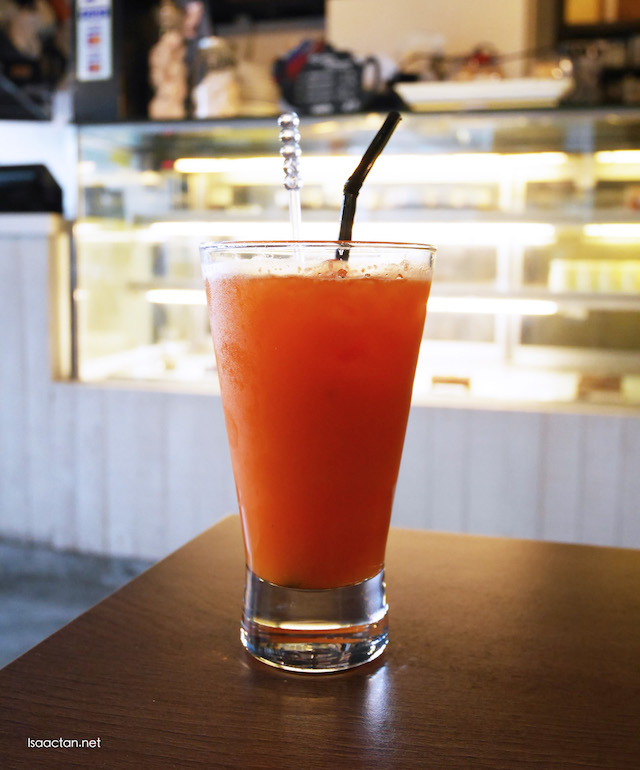 La Casa is indeed generous with the honey, as I could taste it in the juice. Love it. During the creation of these dishes a lot of emphasis was put on the conservation of the natural contents. For that reason the both fish and the chicken are being grilled instead of roasted or fried which preserves the protein and keeps the healthy acids intact. Both Glorious Green and Ravishing Red will only be available at La Casa from now until April 30 for RM49++ and RM59++ respectively, so be sure to try them out before the promotion ends! I would go for the grilled salmon, the portion looks big.